Depending on the structure of the data frame, we may have to melt the data before calling the google vis functions. The above code was simply tagged along to the previous blog post code. The gvis.html file contains the html/java script code which takes care of the rest. 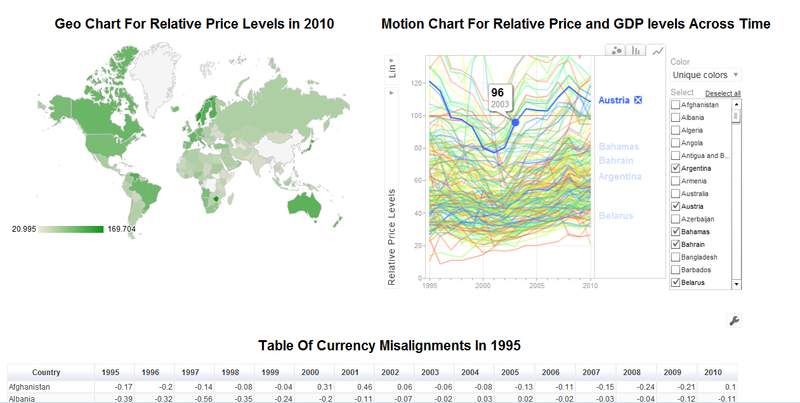 The first plot shows a map of the world, colour coded based on the relative price levels across all countries. Hovering the mouse over the country should yield more exact information. The second plot is a motion chart with many plotting options available. The table on the bottom of the page records the residuals from the Balassa-Samuelson regression (i.e.currency misalignments across time and countries). The Treemap plotted below this table visualises the same data set. The titles for the plots were added on after the html file was generated in R.
The following is a snapshot of the plots followed by the drop box link. The Treemap was added later. We need at least 4 columns of data : the id of each rectangle (country),the parent of each country (global), the values for the countries (absolute values of currency misalignments in 1995 across 189 countries),the colours for the countries (original values of said misalignments).